Tag Archives: BOATS BOATS BOATS! The LST or Landing Ship Tank a ship Only The Allies Had: The Ship That Could Deliver A Tank Right To The Beach! 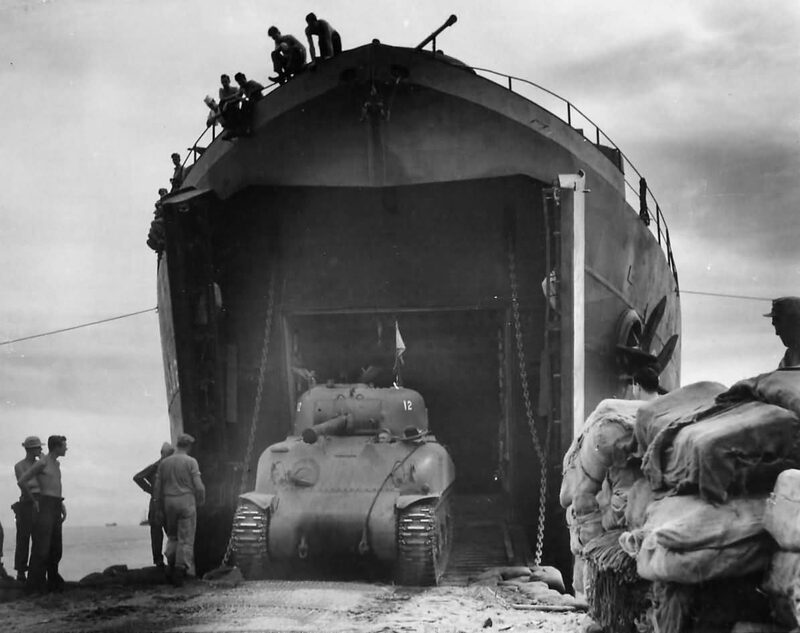 When most people think about a tank being used in a beach assault, they think the Duplex Drive Sherman, or tanks getting delivered by LCM or LCT. There were many other specialized landing craft, and they all had similar flaws. The main being they were small, and not really capable of long ocean voyages. They also couldn’t haul a useful amount of cargo for use in an efficient shipping system. 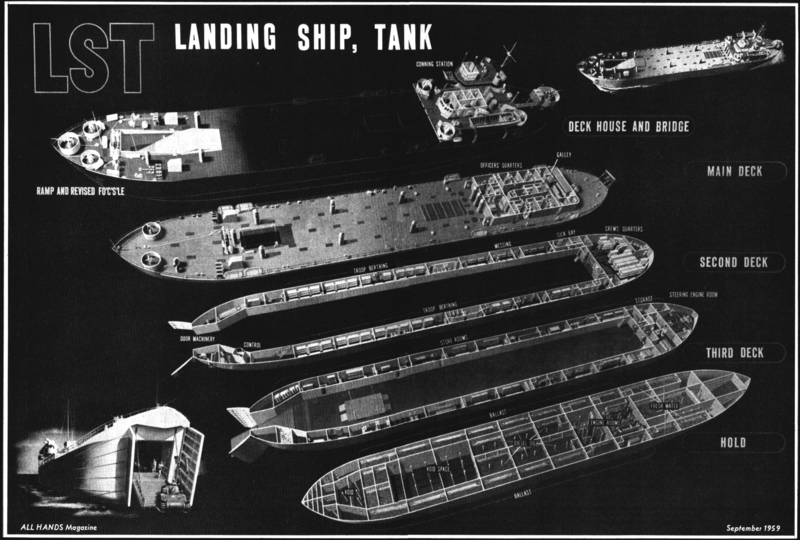 The LST or Landing Ship Tank was the solution. The LST a large ocean-going vessel, and though they reputed to have a horrible ride, were capable of crossing the Pacific or Atlantic oceans with their own fuel stores. There were several classes of LST but the differences between them were fairly minor unless you want to get into the British made LSTs, but we’ll do that later. 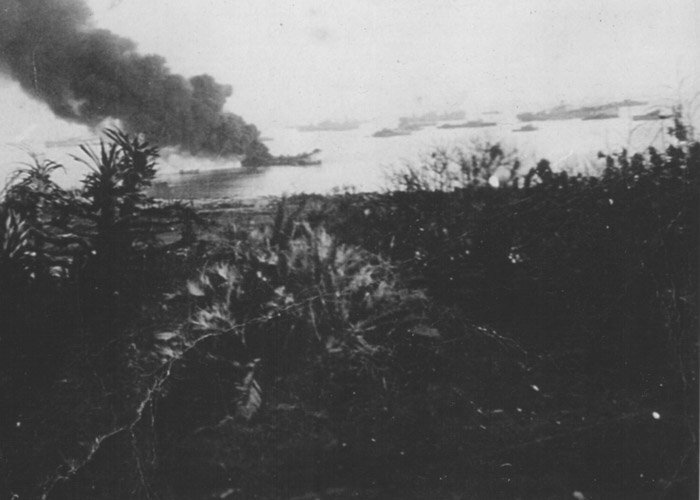 For our purposes we are going to use LST-808 as our example, she participated in Iwo Jima and Okinawa. She was lost to a Kamikaze towards the end of the war. 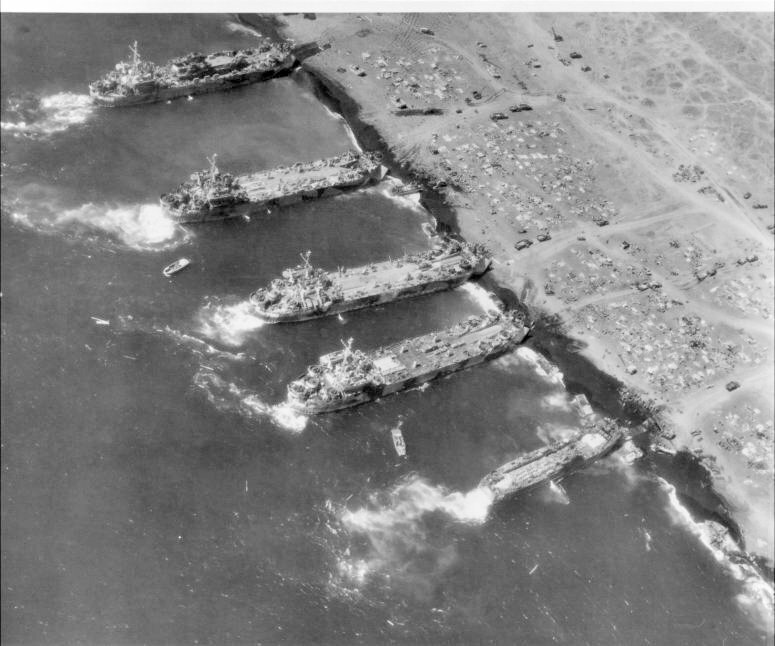 As you can see from the specifications, these ships, were pretty big and over a football field long. 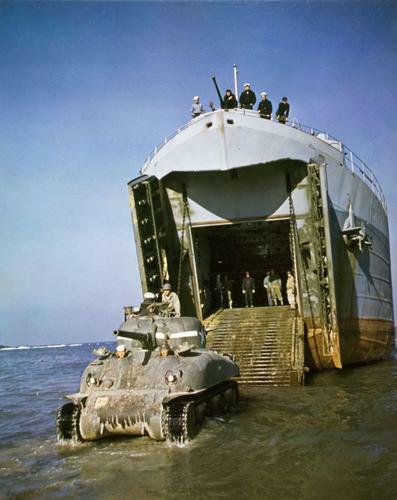 The tank deck had a massive capacity; it could take up to 20 Sherman tanks, 39 M3/M5 light tanks or 70 trucks or anything else that would fit up to 1900 tons. Not only did they have the ability to carry the vehicles, there were accommodations aboard for the crews and troops that would be riding the ship. The LSTs were longships, and their front hull had a much shallower draft than the rear. The front of the hull was made up from a pair of huge doors that opened out, and behind them was a ramp that was dropped. If shore conditions were right, the ramp could be dropped in the shallow surf and vehicles drove right off and onto the beach. If beach conditions were not right, like a sandbar or reef stood in the way, they could use floating pontoon docks to make a causeway that tanks or anything else could drive to shore on. These causeways would be held in place by LCMs. 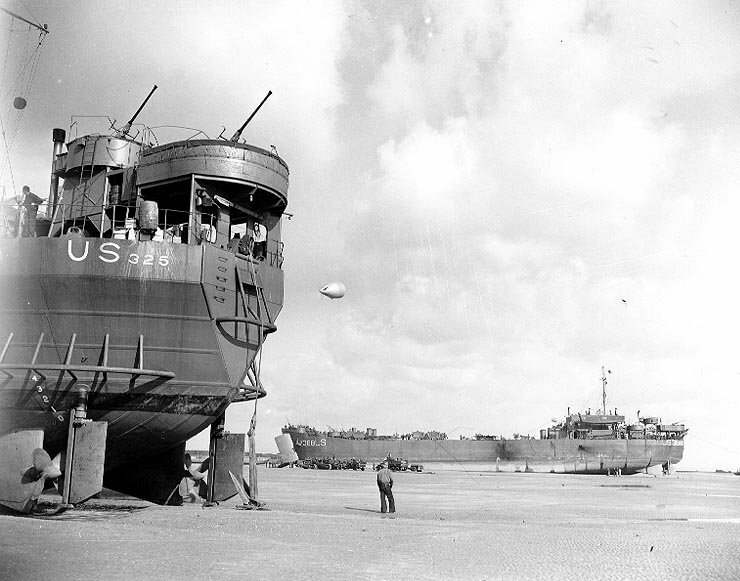 The LST could carry large numbers of the pontoons as deck cargo. They would know ahead of time what the beach conditions were going to be and what they would need to bring. This ingenious system was something only the allies, and specifically, the US and the UK came up with. Nazis were not good at logistics. The LST used a system of pumps to fill or pump out large numbers of compartments all around the hull to raise or lower the ship in the water. When they were about to beach the front of the ship, the would need to be as high in the water as they could, but at sea, they would want many of the void spaces flooded to keep the flat-bottomed LST from rolling around so much in even mild weather. 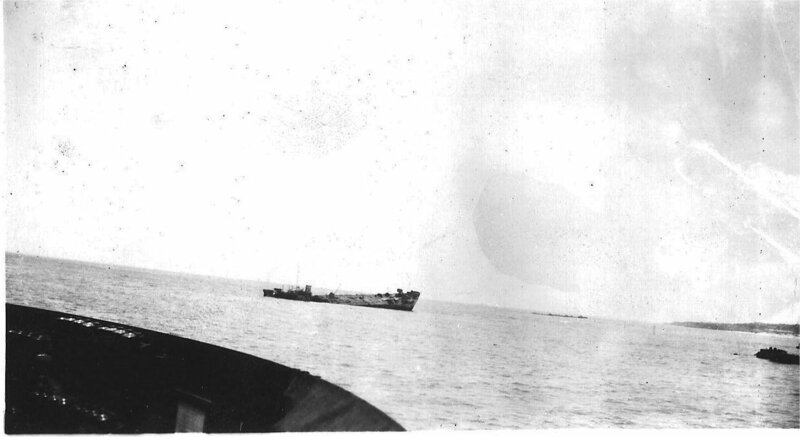 Even loaded up and with the ballast spaces as full as was safe, the LST’s still had a less than ideal ride. Very few were lost to weather though. I don’t have a good breakdown of the numbers but the US had 933 LST(2) and 26 were lost to enemy action. They lost another 13 to fires, collisions, explosions, storms, and groundings. The rest were worked to death in the decades after the war with a few exceptions. One of those exceptions is LST-325, she is still around, and a museum ship, but the best kind of museum ship, the kind that can still get underway! Check out LST-325s webpage, they may be coming to a city near you! 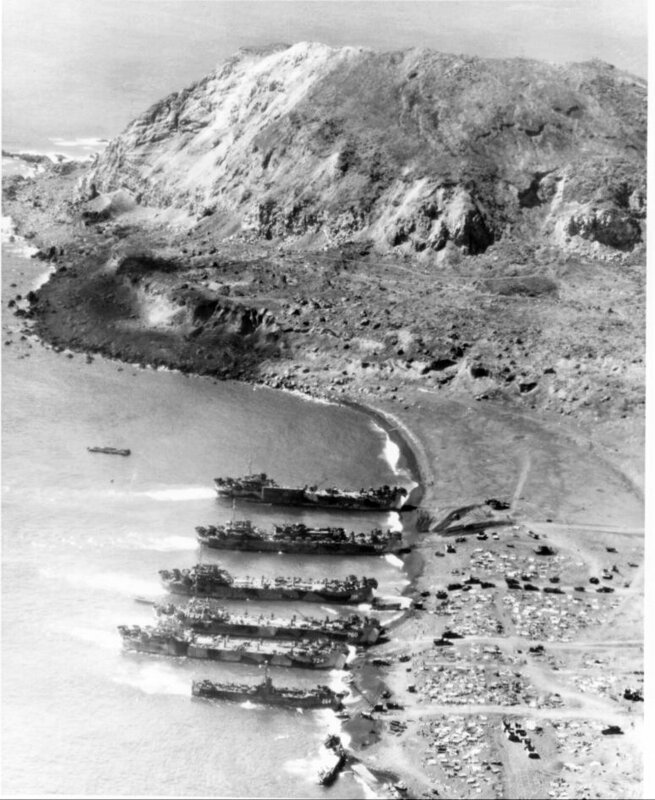 Another shot of LSTs on Iwo, what’s that mountain!? Being an LST captain was not something a career naval officer would have wanted, and most officers were reservists. Some joined their ship while it was being built, and would stay with it until wars end, or it was sunk. The LSTs were not the worst ships to serve on, they had a nicely appointed galley, and served with the same men the whole war, including the enlisted crew. The LST proved to be pretty safe and durable because of how they were built, with a lot of reserve buoyancy. They also had the capacity to produce a lot of fresh water. The tank deck had to be ventilated so the tanks could be run, early LSTs had hoses that were hooked up the tanks or other vehicles exhaust. That setup did not work well, so twelve, eight-foot-tall ventilation stacks, with a fan in each were installed. These could clear the tank deck of vehicle exhaust even with the bow doors closed. There was an elevator on early LSTs, but it was slow and not all that reliable, so it was replaced with a simple hinged ramp. The ships were also well appointed with shops including a machine shop with a full complement of metalworking tools, and there was probably an electrical and hydraulic shop as well. The Captain would be a full Lieutenant of the Navy, and the XO a JG. As mentioned before in many cases these men joined the ship while it was being finished, right after they finished they Navy Officer or Boot Camp, and a few cases specialty schools. They would work with the builder to get their LST working and get it commissioned and then take it out, often right to a combat area but they might stay stateside for more training. The Army Armor base at Fort Knox built a replica of a tank deck on the base so tank crews could practice loading and offloading. The US Navy built 1051 LSTs were built in the US. Most of them served with the US, but some went to the UK, and the Greeks even operated some. After the war, the surplus LSTs were bought up by commercial interests right away. They are very useful for delivering heavy cargo to areas with no heavy port facilities. A few survive to this day. Now for my obligatory section on why this ship was something the Germans had nothing like. The Germans also lacked the ability to build all the different landing craft the allies used in their multiple successful amphibious landings. Germany was short of resources, and even if they had been given the plans for the LST and all the various other landing craft you need to land on an enemy shore, they didn’t have the naval construction capacity or natural resources to produce them. Maybe if they had not built their silly battleships, but that gets to the other problem, they never achieved air superiority, nor naval supremacy in a time frame they would have needed to pull off operation sea lion. Nazi Germany was bad at boats and planes, but great at propaganda, some people still buy into even today. 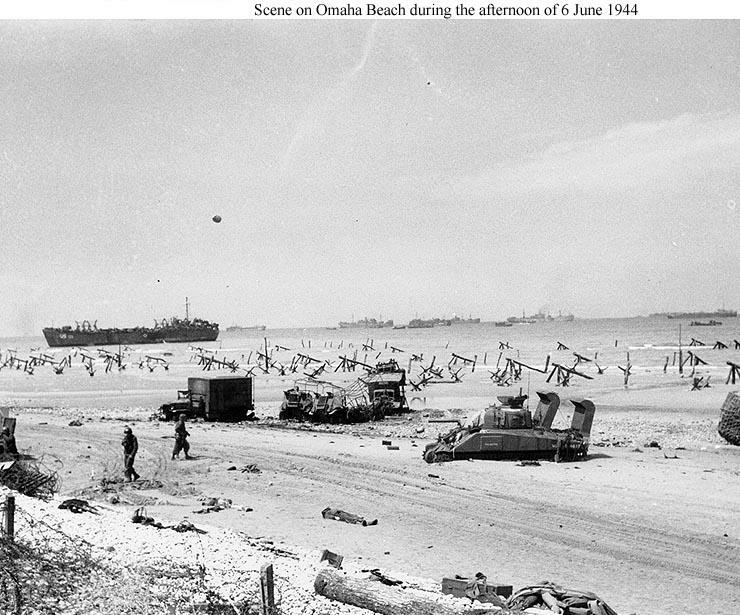 LST high and dry at Normandy, click the image to see if LST-325 is going to be at a city near you!